Three determined Arrowtown youngsters turned their back on the usual teenage distractions, instead dedicating their time to achieving the highest honour in scouting. 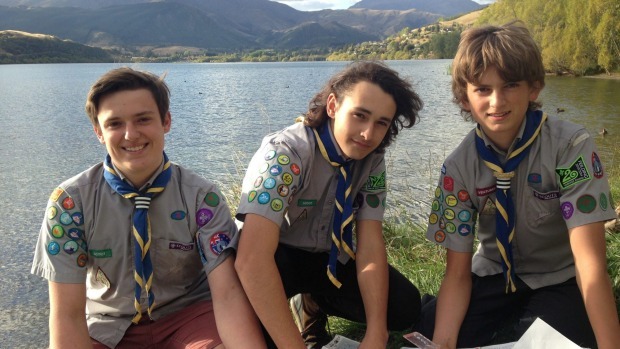 Ben Kunath, Nick Thompson and Jack Wilson, now all 15, are believed to be the first in the Arrowtown area for at least 10 years to receive their Chief Scout’s Award, which is signed off by the Governor General, the Rt Hon Dame Patsy Reddy. Arrowtown Scouts’ section leader Juliet Pope said the boys started scouts, aged 10, and worked their way up through the bronze, silver and gold medals to the “pinnacle of scouting”. One of the greatest hurdles was completing the four-day Explorer’s Challenge, which involved using all modes of transport and organising themselves over 150km of terrain. They set off earlier last year from Arrowtown, heading up Tobins Track to Royalburn Station and camping out on the Crown Terrace. The boys spent the night alone in a remote hut in the hills after hiking for six or seven hours from the Crown Terrace look-out. Their adventure also included floating down the Cardrona River on inflatable lilos, camping out at Gibbston and cycling back to Arrowtown. Outdoor activities were a real strength for the Arrowtown Scouts and Pope said there was a big waiting list to get into the troop. The boys had to plan and run a two-night scout camp and complete 40 to 50 nights of scout camps themselves. They also spent six months leading local kea and cub scouts, collected pine cones for the elderly, assisted the Wakatipu Reforestation Trust with mulching, and passed their Level 2 First Aid Certificate. “It’s quite rare to have boys putting in that amount of commitment for so long,” Pope said. To top it all off they had to organise and front up for a one-on-one interview, complete with their CV, with Cromwell-based Scouts New Zealand zone leader Les Riddell. Only 150 scouts in New Zealand achieve the highest award each year, she said. Queenstown Lakes Mayor Jim Boult will present the boys with their award on May 31 during a special presentation at the Arrowtown School Hall. Five scouts from Cromwell and Alexandra have also been awarded their chief scout awards during the past year, and one her Queen’s scout award. The boys have all now moved on to Venturers.